A video booth is similar to a photo booth except instead of taking one or more stills pictures it captures a short video clip. Video booth shooting is available with all Canon DSLR cameras that support movie mode except for the Canon Digital Rebel T1i/EOS 500D. The cameras can only capture video to the camera's memory card and so the camera must have a memory card with sufficient space in order to use the video booth mode (video files are automatically downloaded to the PC and deleted from the memory card after capture). WARNING: If the camera's memory card is full the software will attempt to capture the video but will stall when it tries to download it to the PC. To avoid this problem please make sure there is plenty of free space on the memory card. Please note: The camera must be set to photo mode not video mode. Cameras with movie mode on the exposure mode dial should be set to P, Tv, Av or M.
Video booth mode can also be used to capture a series of still photos which can be combined to create a short animated GIF that plays back in a continuous loop. The animated GIF isn't created directly by DSLR Remote Pro for Windows, instead it automatically calls a script to create the animated GIF. Please see this section for more details. The video booth mode works in a similar way to photo booth mode. Users are presented with a ready screen with a live view display showing what the camera sees. When the user presses the start button a countdown screen is displayed together with countdown message. At the end of the countdown the capture screen is displayed together with a progress bar that shows how much time is remaining. After the video clip has been captured the processing screen is displayed and the movie file is automatically downloaded from the camera's memory card to the PC and then deleted from the memory card to make space for the next clip. After downloading the ready screen is displayed ready for the next video capture. In order to use the video booth mode it must be enabled by selecting "Enable video in photo booth mode". Normally when you enter full screen photo booth mode (by typing Ctrl+F4) the photo booth ready screen will be displayed. If you wish to startup in video booth mode select the "Startup in video booth mode when selecting full screen photo booth" checkbox. Select the "Hide live view during countdown and capture" to only display live view in the ready screen and avoid guests being distracted by the live view during video capture. Select the "Display playback screen after capturing video" to allow users to play back the video and decide whether to accept it or reject it. The playback screen will be displayed until the user either accepts or rejects the video. When the video is rejected it is automatically deleted from the computer. When the "Start playback automatically" option is selected video playback will start automatically when the playback screen is displayed. The playback screen will be displayed until either the user accepts or rejects the video or the timeout occurs. Use the "Playback screen timeout" setting to specify the length of the timeout and the "Timeout action:" dropdown to specify what happens when the timeout occurs. The playback can be delayed to allow time for post processing by setting the "Delay before playback". The delay can be cut short by sending Ctrl+Z to the photo booth. This allows the delay before playback to minimized by setting a long delay and arranging for Ctrl+Z to be sent when the processed video is ready. An optional video_confirmed.jpg screen can be displayed after the sharing screen (or after accepting playback when not sharing) by setting the "Confirmed screen display time". Set this to the number of seconds to display the video_confirmed.jpg screen or set it to 0 to disable the screen. Use the "Duration of captured video clip" setting to specify the duration of the video clip in seconds. This can be any value up to 1200 seconds (20 minutes). Please note that users can end the recording before it reaches the the preset duration by pressing the End key or "Stop video capture" touchscreen action. Use the "..." buttons after the font and font color displays to change the font and color of the countdown text. The size and position of the video playback window can be set manually or set automatically by the program. If the height is set to 0 the program will automatically display the video playback at the same resolution as capture, or if this is to big to fit on the screen it will scale the size down to fit the screen. The video playback window is normally displayed at the top of the screen but can be moved down using the top offset setting if required. The video playback window left offset allows the horizontal position of the window to be specified. The default setting of -1 will center the video playback window on the screen. Use the "..." buttons after the record/playback progress bar foreground and background color displays to change the colors of the progress bar displayed during recording and playback. Note: the progress bar can be hidden by setting the foreground and background colors to the same values. The size and position of the live view display uses the same settings as the stills photo booth and can be specified using the photo booth settings dialog. 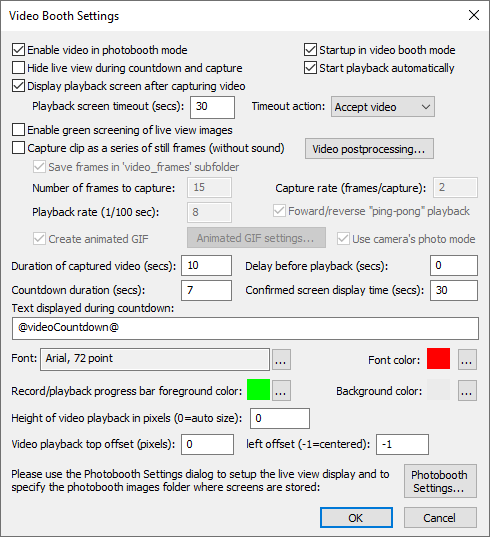 The various screens used by the video booth should be saved in the photo booth images folder which can also be specified using the photo booth settings dialog. Click on the "Photobooth Settings..." button to save the current video booth settings and display the photo booth settings dialog. Slow motion video can be captured using the Canon EOS M50 by setting the video format to 1280x720 120fps. When this setting is used the video will be captured at 120fps without sound and is saved at 30fps giving playback at 1/4 normal speed. Currently the Canon EOS M50 is the only Canon camera that can be used to capture 120fps video. The camera automatically saves the video at 30fps and no post processing of the video is required. Other camera models can capture video at up to 60fps which can be played back at a slower rate (e.g. 1/4 normal speed by setting the video playback rate to 25), but this won't give as good quality as the Canon EOS M50 capturing at 120fps. Also, the videos are saved at 60fps and need to be post processed to create a slow motion copy without sound. Select the "Enable green screening of live view images" option to shoot green screen videos. Then type Ctrl+G in full screen photo booth mode to adjust the green screen settings (please see the section on green screen shooting for more information). In full screen video booth mode the green screen background and overlay images are loaded from the photo boothimages folder. The background image should be named video_greenscreen_background.jpg or greenscreen_background.jpg and the overlay image should be named video_greenscreen_overlay.png or greenscreen_overlay.png. The software will look for video_greenscreen_background.jpg and video_greenscreen_overlay.png first and use these if available. If they are not available it will look forgreenscreen_background and greenscreen_overlay.png images. Backgrounds and overlays can also be switched by saving a number of different profiles each using a different photo booth images folder containing different greenscreen_background.jpg and greenscreen_overlay.png images. The user can then select the different backgrounds using the profile shortcut keys. You can also switch green screen backgrounds and overlays by copying the new greenscreen_background.jpg and greenscreen_overlay.png images into the photo booth images folder while the booth is running. Please note: In video booth mode green screening is only applied to the live view images displayed to the user. It is not applied to the movie files downloaded from the camera or during video playback. You will need additional third party software to green screen the movie files after they have been downloaded to the PC (DSLR Remote Pro automatically downloads the movie files to the PC). Video booth mode can also be used to capture a series of still photos which can be combined to create an animated GIF which plays in a continuous loop. The animation can play the clip continuously, repeating from the start (e.g. frames 1, 2, 3, 4, 5 then frames 1, 2, 3, 4, 5 again) or it can play the clip forwards then backwards (e.g. frames 1, 2, 3, 4, 5, 4, 3, 2, 1, 2, 3, 4, 5 etc.). The still frames are captured from the live view display and will be green screened if "Enable green screening of live view images" is selected. The size of saved photos will depend on the resolution of the live view images for the camera being used. Recent Canon DSLRs have a live view resolution of 960x640 pixels. To enable this select the "Capture clip as a series of still frames (without sound)" option. Then select the number of frames to capture in the sequence. Setting the number of frames to between 5 and 10 works well for a 1 sec or 2 sec clip. A higher value will give a smoother animation but will result in a larger file size. A smaller value may cause the clip to appear as a series of jumps from frame to frame rather than as an animation. The "Capture rate (frames/capture)" setting specifies how often the live view frames should be saved. The live view frame rate is approximately 12 frames/sec, but this may depend on the camera model and the speed of the computer. Setting the capture rate to 5 frames/capture will capture a frame approximately every 0.4 secs. The duration of the clip depends on the live view frame rate, the capture rate and the number of frames to capture e.g. with a live view frame rate of 12fps, capturing a total of 6 frames at a rate of one frame every 5 live view frames the clip would take 6 * 5 / 12 = 2.5 secs. Select the "Display playback screen after capturing video" option to play back the clip after capture. The playback rate is specified as the time each frame is displayed in 1/100 sec e.g. setting this to 8 will play the clip back at approximately normal speed (approx 12fps), 16 will play it back in approximately half speed slow motion (approx 6 fps) etc. Normally the clip is played back in the forward direction in a loop e.g. frame 1, 2, 3, 4, 5, 6, 7, 8, 9, 10, 1, 2, 3, 4, 5, 6, 7, 8, 9, 10, 1, 2, 3 etc. Select the 'Forward/reverse "ping-pong" playback' option to play the clip forwards then backwards before repeating e.g. frame 1, 2, 3, 4, 5, 6, 7, 8, 9, 10, 9, 8, 7, 6, 5, 4, 3, 2, 1, 2, 3, 4, 5, 6, 7, 8, 9, 10, 9, 8, 7 etc. Select the "Create animated GIF" option and set the width to created an animated GIF of the video clip. Please see the Animated GIF section for details on how to set this up. Breeze Systems' Breeze Kiosk software can be used to view the animated GIFs as a slideshow or interactively so that users can email the animated GIFs. The images displayed to the user should be the same size or bigger than the computer's display. If the images are too small they will be expanded to fit with a black border and a small warning message will be displayed in the bottom left corner showing the image size and the display size. Audio prompts can be added by placing a WAV sound file in the photo booth images folder and giving it the same name as prompt screen. For example to play a sound when the video booth is ready copy a WAV file named video_ready.wav into the photo booth images folder and it will be played when the video_ready.jpg image is displayed. Once everything is setup simply run DSLR Remote Pro for Windows and press Ctrl+F4 to enter full screen mode and display the ready screen. If the "Startup in video booth mode when selecting full screen photo booth" is not set the window will start in photo booth mode. You can switch from photo booth mode to video booth mode by typing Ctrl+V and from video booth mode back to photo booth mode by typing Ctrl+P. In video booth mode press F7 to start the video capture sequence. The user can then press the "End" key to stop the recording or wait until it reaches the duration setting and stops automatically. When the video playback screen is displayed the user can type P to play the video, A to accept it or X to reject it. Please see keyboard shortcuts for a complete list of keyboard shortcuts. The user must either accept or reject the video before the booth will return to the ready screen. When the user rejects the video to movie file is deleted and is not saved on the camera's memory card or the PC's hard disk. There is a default timeout of 300 secs after which time the video will be automatically accepted. This timeout can be set in the video booth settings dialog. If "auto reconnect" is selected from the "Camera" menu the camera can be turned off when not in use and then turned it back on again to automatically restart photo booth operation. When the camera is turned off the camera_not_connected.jpg screen is displayed and when it is turned back on again the ready screen is displayed. To exit full screen photo booth mode either press the Esc key or hold down the SHIFT key and press the left mouse button.